EAP hosts several affinity circles, where individuals can learn, connect, and collaborate around specific topics or job roles. These networks are open the public and always free for members. EAP is a founding member of the Bay Area Cultural Data Network, in partnership with DataArts. We are committed to exploring the intersection of cultural data and equity, industry and individual challenges around data in the Bay Area, and roles and solutions a Cultural Data Network might serve. We invite the sector to engage in generative, poignant, open-ended conversations to move the sector forward and seek to build or modify existing resources to act as the central hub for these learnings and conversations. The Bay Area Cultural Data Network meets quarterly, usually via video/phone conference, with in-person meetings once a year. Email engagement@emergingsf.org if you are interested in joining this group. 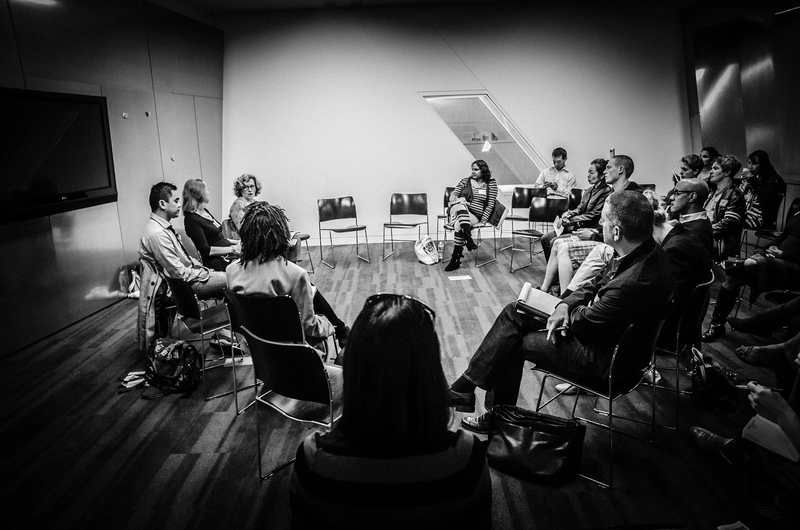 EAP’s Curators’ Circle is a professional meet-up hosted quarterly to support the work of Curators and Cultural Producers through discussion, problem-solving, and knowledge and resource sharing. The gathering is open to all styles, disciplines (dance, visual, etc. ), and models (museum, independent, etc. ), with the goal of cross-pollinating a siloed sector of the arts. “Curator” and “Cultural Producer” are broadly defined here. If you gather artists and/or their work to present to the public, then come join us. All mediums, disciplines, and models are welcome. The Curator Circle meets quarterly, usually on Monday nights, 6:30-9PM. Registration required. See Eventbrite and Facebook for upcoming gatherings. Culturally-Specific Projects Network convenes to share strategies, resources, challenges, and to coordinate efforts in support of culturally-specific art projects and organizations in the Bay Area. Our first convening was February 2017; members include arts service providers, community ambassadors, leaders, and traditional/cultural artists, all whose work is rooted in a specific cultural identity/ heritage. The Culturally-Specific Projects Network meets every other month, usually on Friday afternoons.